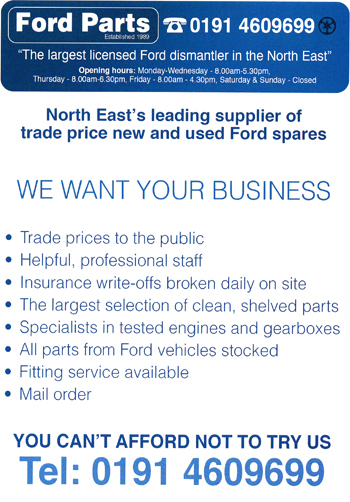 Ford Parts was established in 1989 on Westgate Road, Newcastle. 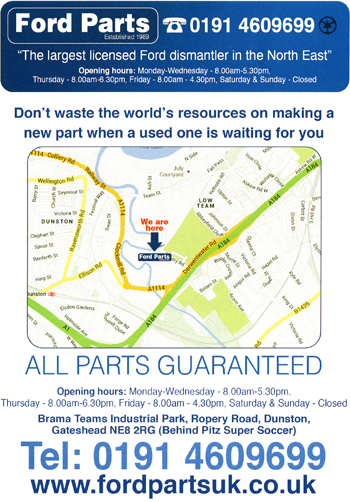 In 1999 the company moved to a purpose built site based in Dunston. It is from this establishment that we have been offering a cheap, cost effective and reliable service in fitting and repairs and used Ford spares. This service is not just in the local area as we also offer mail order worldwide. Ford Parts also try to give back to the community and in doing so we sponsor the local Dunston ABC Boxing Club as well supporting our real passion, Motorsport. It is in this world of motorsport and cars that we have supported local motor clubs in the North East region and have also worked alongside Whickham and District Motor Club. Through our involvement with Whickham and DMC and the Training weekends in recent years which provide practical and vital training for motorsport marshals, Ford Parts and Whickham and DMC have forged a good relationship, resulting in our support for the Cheviot Keith Knox Stages Rally. We look forward to the event and offer a warm welcome to all the organisers, marshals, competitors and their crews.